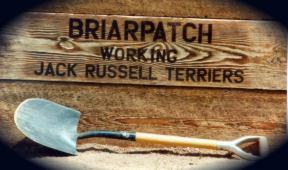 Life at Briarpatch is Jack Russell Terriers. For over 30 years we have been hunting, breeding, showing, and just plain enjoying every aspect of the Jack Russell Terrier. We are dedicated to preserving the working ability and unique character of this great little dog . In our breeding program, we strive for keen working ability, correct conformation with excellent flexibility for working, good coats, athletic ability, and of course the naturally good temperaments so characteristic of this breed. We like a terrier that is narrow and flexible, with a small chest and sufficient bone, suitable to work in any situation. Our aim has always been to breed a terrier that not only looks and works good at one to two years of age, but is still as good at six to eight years of age. A correctly conformed working terrier should be able to maintain his chest size and flexibility past the naturally flexible ages of one and two years. We are proud that our foundation dogs have this outstanding working structure, and that they have passed it down for many generations. Our foundation breeding stock came from some of the best working kennels in England. We especially thank Alf Edmunds (Maven's) and Greg Mousley (Meynell) for their great strains of working terriers and the ones they sent to Briarpatch. We work actively for the breed through the Jack Russell Terrier Club of America, and strongly believe in the JRTCA's dedication to preserving the Jack Russell as a working breed. We are adamantly opposed to recognition of the Jack Russell by any kennel club or all-breed registry, as we believe that inbreeding, coupled with popularity amongst those interested purely in showing and breeding for profit, will eventually lead to the decline of the Jack Russell as the great working breed it has been for so many years past. We also believe that while conformation showing is important to the betterment of the breed, it can also be damaging if not kept in the proper perspective to this little terrier which should be bred primarily for work, not for show. Our terriers have earned many conformation awards over the years, but we are now nearly retired from showing but still do some field work. Our terriers are worked seasonally, and a good working dog continues to be our main goal. A good working dog, with the physical and mental characteristics desired, makes an equally wonderful pet and companion. It's what the Jack Russell Terrier is all about. All of our terriers have a complete pedigree and are registered with the JRTCA. This web site is designed to introduce our terriers and our breeding program to you.... we're proud of our terriers, and we'd love to show them to you in person! We love terriers and terrier people, and we'd be happy to talk terriers with you any time! We're located just off Interstate 83 between Baltimore, MD and York, PA near the MD-PA state lines. If you're in the area, give us a call and stop by!